File: The Virginia Theatre in Champaign, Illinois. 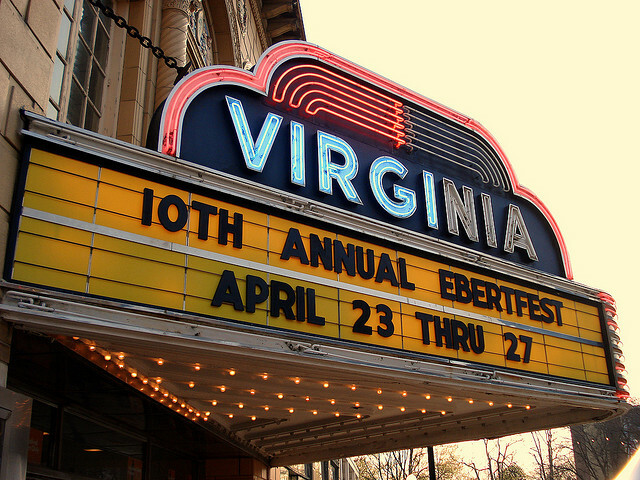 A sold-out crowd will gather in Wednesday night for the 15th annual Ebertfest. The 15th annual Roger Ebert Film Festival kicks off in Champaign, Illinois on Wednesday. Roger Ebert won’t be there. The famed Chicago film critic died earlier this month, just after stepping down (he called it a “leave of presence”) as the Sun-Times film critic. But Ebert’s ethos—his influence and taste and general good spirit—is all over the event. Ebertfest doesn’t work like a typical film festival. The movies aren’t submitted. They are hand selected by Ebert and his staff. They’re not “in contention,” or vying for prizes from select juries made up of celebrated members of the global film community. You also won’t see studio types hanging around Champaign, trying to make distribution deals. But there will be some film stars on hand. Actors Jack Black and Tilda Swinton will introduce and talk about their respective films Bernie and Julia. Haskell Wexler, the legendary Chicago cinematographer, who is an unbelievable 91 years old (a longevity he chalks up to being grouchy), will introduce the opening night film, Terrence Malick’s 1978 stunner Days of Heaven. Interesting directors abound, from as far away as Australia (Paul Cox, Vincent: The Life and Death of Vincent Van Gogh) and as close as Lake Bluff, Illinois (Randy Moore, who will introduce his intriguing Disney noir Escape from Tomorrow). That effort to include homegrown talent, some with ties to the University of Illinois, is one of the things that makes Ebertfest a special event. But it also just sounds like fun to sit and watch movies, some old and some new, with people who both love films and love to make a living from them. The schedule makes it possible to savor rather than gulp down the experience. Only 12 features and a couple of short subjects will screen over the five-day fest. Obviously watching them all is the thing to do. But here are a few recommendations. Two of my favorites are from last year, Richard Linklater’s Bernie and Joachim Trier’s Oslo, August 31st are very different movies that nonetheless have a surprising amount in common. Both directors are independents who’ve also formed ties with commercial enterprises (Hollywood and advertising respectively). Both have a deep interest in films about ‘generational drift,’ or the ways young people struggle to find and maintain a sense of identity and place within a larger community and set of values. And both of these films are driven by the performances of their incredible leads. Jack Black practically reinvented himself as an actor in Bernie, and absolutely should have been nominated for a best actor Oscar last year. But if you haven’t yet watched Anders Danielsen Lie, who has now made two films with Trier, I think you’ll be moved by his turn in Oslo. His character veers between possibility and pathos on his way to a tragic end. And as Ebert suggested in his review, you almost want to reach out and steer him out of the film and destiny he’s trapped in, into another life, or maybe a different movie. And because the pleasures of filmgoing can rise and fall on the company you keep, I wouldn’t miss the opportunity to watch Days of Heaven with the Ebertfest crowd. Now that Malick (another Illinois native) is practically churning out the films, it is hard to remember the days when he hadn’t made a movie for twenty years, when we only had Badlands and Days by which to assess his talents. Back then his films seemed like far cries from a distant country—what genius went into the wilds of the American landscape and emerged with these earthy and feverish tales? These days I’m less enamored of his films. But what a great crowd with whom to rehash his career. Finally, Tilda Swinton in person? Wow. The 15th Annual Roger Ebert Film Festival kicks off Wednesday and runs through Sunday at the Virginia Theatre in Champaign, Illinois. The event is sold out. Alison Cuddy is WBEZ’s Arts and Culture reporter. Follow her @wbezacuddy, Facebook and Instagram.